Describe the differences between managed and unmanaged packages. List key questions to ask before installing a package. Install a package in your org. Describe how to connect with other superheroes and AppExchange. In the last unit, you went the superheroic route to finding a solution for Ursa Major, expertly employing an AppExchange strategy to track down the Salesforce Adoption Dashboards app. So is that it? Are you a full-fledged AppExchange Superhero? Not quite! Before throwing on that cape and spandex, you have a few more skills to master. In this unit, we focus on the installation process, including package types and installation best practices. Then you practice everything by installing the Adoption Dashboards app in your org. AppExchange solutions are delivered to your org in packages, which are containers for apps, tabs, and objects. Packages come in two flavors: managed and unmanaged. The provider decides which package type to use to distribute a solution, which in turn influences how the solution behaves in your org. Let’s review the most important differences between package types. Customization You can’t view or change the offering’s code or metadata. You can customize code and metadata, if desired. Upgrades The provider can automatically upgrade the offering. To receive an upgrade, you must uninstall the package from your org and then reinstall a new version from AppExchange. Org limits The contents of the package don’t count against the app, tab, and object limits in your org. The contents of the package count against the app, tab, and object limits in your org. If you’re interested in getting under the hood of a solution, look for an unmanaged package. Otherwise, a managed package probably suits your needs, because you can install it without worrying how it affects your org’s app, tab, and object limits. Plus, upgrades are seamless. Now that we’ve reviewed the differences between package types, let’s look at how to approach the installation process. Am I installing the package in the right org? Remember, AppExchange Superheroes never install in production without testing in a Developer Edition org or a sandbox first. When you’ve decided where to install the package, have the login credentials for that org available. You need those credentials to establish a connection with AppExchange. Have I reviewed the provider’s documentation? Many listings include documentation to help you with installation, configuration, and troubleshooting. If documentation is available, it appears on the Overview tab. Who needs access to the offering? When you install a package, you determine which users can access its functionality. Options include admins only, all users, or specific profiles. If you’re not sure, grant access to admins only—you can always give other users access later. After you’ve considered these questions, you’re ready to install the package. Installation—the defining moment of every AppExchange Superhero’s journey. The moment when all the hard work pays off. Let’s reflect. You identified a business problem and used Ursa Major’s requirements to define a strategy. You used the right AppExchange tool to find a solution in record time. You even mastered the differences between package types, which will make you unstoppable at Salesforce trivia night. The only thing standing between you and installation glory is that short list of questions. Let’s address those now. Org—You’ll install the app in the Developer Edition org that you use for testing new features and completing Trailhead challenges. That way, Ursa Major’s users won’t be impacted if something unexpected happens. Documentation—On the Overview tab of the listing, there’s a datasheet that recommends following Salesforce’s normal install procedure. Access—You’re the only person who needs to use the app, so you’ll install for admins only. In a new browser tab, open the Salesforce Adoption Dashboards listing and then click Get It Now. Enter the credentials for the org that you use to complete Trailhead challenges and then click Log In. Click Get It Now again. Confirm that you’re installing the package in your Trailhead challenge org, and then select the box to agree to our terms and conditions. Enter your login credentials again. Select Install for Admins Only. Leave the other options as-is. Click Install. The package can take a few minutes to install. Click Done to view the package in your org. When the package finishes installing, your org displays the Installed Packages page in Setup. From here, you can view details for individual packages and perform administrative tasks, like uninstallations. For now, you just want to see the Adoption Dashboards’ functionality firsthand. Let’s do that. The app includes 2 dashboards. The first focuses on user behavior, like the number of logins by region or role. The second focuses on usage of key objects, such as the number of new account records created. User adoption data is at the top of your list of requirements, so let’s drill into the first dashboard. 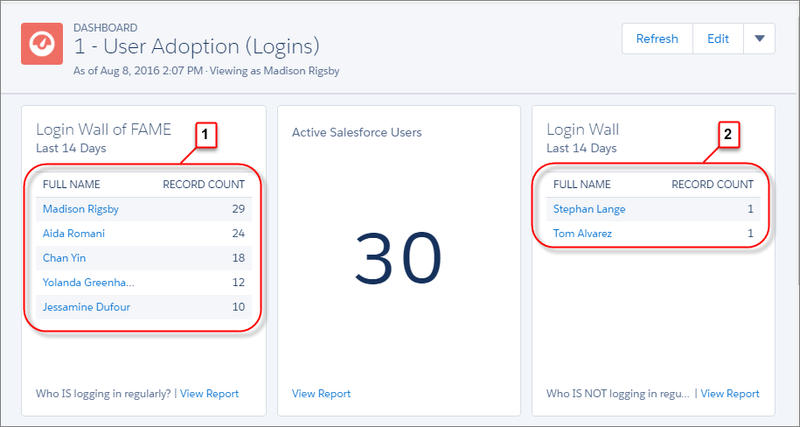 In the Salesforce navigation menu, click Dashboards. 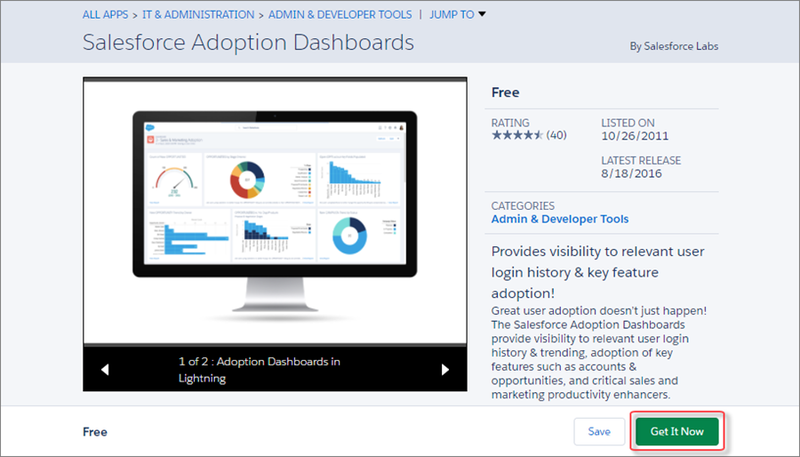 In Lightning Experience, click All Dashboards and then click Salesforce Adoption Dashboards. 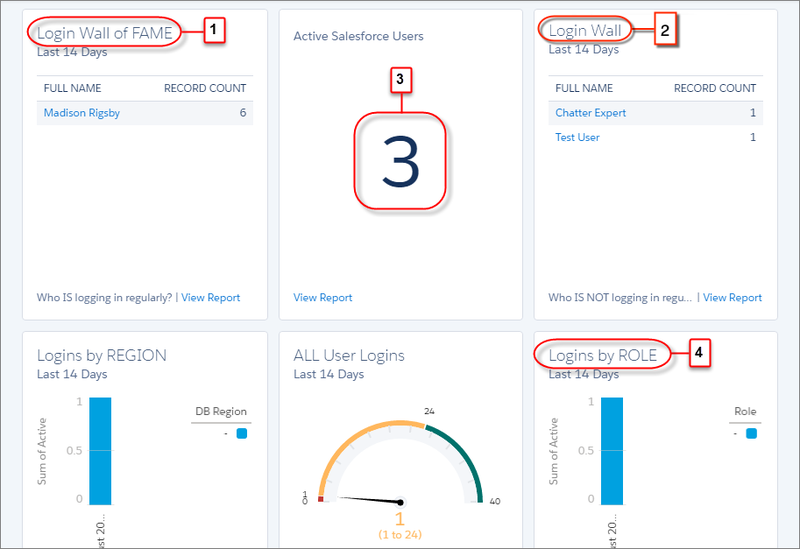 In Salesforce Classic, click Salesforce Adoption Dashboards. Click 1 - User Adoption (Logins) to open the User Adoption dashboard. Even without production data, you can see that the dashboard provides all the functionality you were looking for in your AppExchange strategy, like who’s logging in most (1) and least (2). There’s also data that could come in handy down the road, like total logins (3) and logins by role (4). Because you did things like an AppExchange Superhero, nothing in the dashboard required building or configuration on your part. Instead, you can spend that time getting Ursa Major’s sales team to 100% adoption. Speaking of which, let’s see how that might unfold. Imagine that a week has passed since you installed the Adoption Dashboards app in your test org. In that time, you continued testing the app and experimenting with its functionality. Finding that it met your needs in its default configuration, you went ahead and installed the app in production. Looking now at the User Adoption dashboard with live data, here’s what you see. On the left (1), you have a clear picture of which sales reps (1) are logging in to Salesforce regularly. On the right (2), you see a few reps who are ready to make a Wall of Fame debut, with maybe a gentle nudge from you. You decide to reach out to the reps to schedule some hands-on training. You'll also show them Trailhead and help them sign up, so that they can get in on the learning goodness. Because Ursa Major is adding to its sales team every quarter, you decide to keep the dashboard around to monitor adoption on an ongoing basis. In the first unit, you learned that AppExchange isn’t just a tool in your utility belt—it’s a community. And as a newly minted AppExchange Superhero, you’ve become an important part of that community. Your greatest power there? No, it’s not your ability to craft error-defying processes in Process Builder. It’s your feedback! After you try or buy an offering, make sure to share your experience in a review. By writing a review, you help fellow superheroes understand whether a solution or consulting service is worth their time. You also help the provider understand what’s working and what’s not, which can drive improvements in future versions. To write a review, go to the Reviews tab on a listing and click Write Review. Friend or follow us to hear about news, success stories, and events like the AppExchange Demo Jam, an epic battle between our most popular offerings. Or, you know, send us selfies of your most exciting AppExchange exploits. Congrats, you’ve reached the end of your AppExchange Superhero journey! We’d suggest you take a vacation, but we’re guessing that’s not your style. There’s always more Trailhead to explore, and it looks like Reply Allpocalypse just showed up to cause chaos in Ursa Major’s inboxes. Instead, we compliment you on your choice of costume and wish you well on your next admin adventure. Until next time, hero!